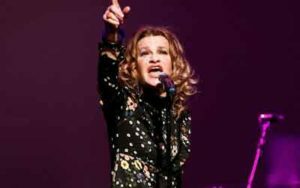 Sandra Bernhard recently gave a packed performance at the House of Independents in Asbury Park, NJ. She brought her cabaret style show Sandemonium. And based on the audience’s reaction to her, she is one of the newest hometown favorites. From the moment Bernhard took the stage, it was clear she was in a room filled with both long time fans from her years of stand up, and “The King Of Comedy” fame. There were some neophyte fans from her latest career incarnation as a radio host on SiriusXM Radio Andy with her appropriately named Monday through Thursday show Sandyland. Bernhard moved effortlessly through her set with her amazing vocals, and stories. 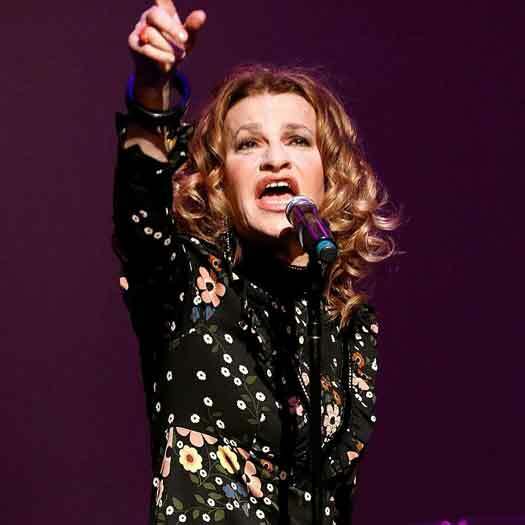 Sandra Bernhard performed at House of Independents in Asbury Park., NJ. 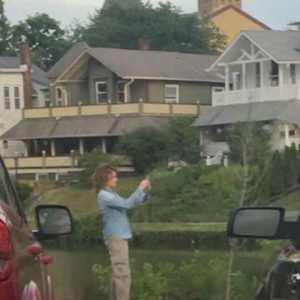 Before the show she took a photo at Wesley Lake. Photo by Michael Cook. Bernhard is able to bounce and flow through a hilarious story of Jane Fonda mistaking her for a different Sandra B. (Bullock) and in the same vein, retelling stories about being a partner, a mother, and a woman in today’s rapidly changing world. A special treat for the Sandyland fans was Sandy’s producer extraordinaire Lisa Mantineo being in the audience live. Bernhard truly shined the most when she talked from the heart about all of us living in today’s world. She mentioned the current political leadership of our country. While Bernhard did speak eloquently and truthfully about the current political landscape, her message was perhaps best conveyed with her raucous rendition of Patti Smith’s musical call to action, “People Have The Power.” The song was complete with a raised and defiant fist throughout the performance, which also served as her final performance of the night. Sandra Bernhard performed at House of Independents in Asbury Park, NJ. Photo by Michael Cook. The words she spoke at the end of the performance to the audience, both “Resist” and “Vote” reverberated throughout the House Of Independents. Bernhard reminded everyone that while sometimes we might feel differently, the “people” both at the event and otherwise, do still, have the power. Before the show, I caught her snapping some shots of the gorgeous homes right on Wesley Lake in Asbury Park. So, as far as celebrity goes, Asbury Park has the market cornered during the summer months. Asbury Park has welcomed luminaries such as Debbie Harry and Stevie Van Zandt in 2018. They were at the New Jersey Hall Of Fame Induction Ceremony. Asbury Park also welcomed Bruce Springsteen and Hugh Jackman (among others) to help officially open the Asbury Lanes last month. It seems more and more celebrities are getting a taste of how amazing Asbury Park really is.